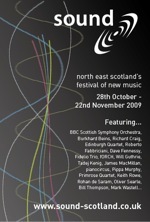 Following a pilot event, "Upbeat" in 2004, the first sound festival was launched in November 2005. It is now an annual event. Details of the current festival are available through our homepage, and information about previous years can be accessed using the links below.